As I wild camped on a beach yesterday, some exciting news broke about the Clore Fellows 2018/2019. I’ve been awarded a Clore Fellowship (supported by Gatsby Charitable Trust). 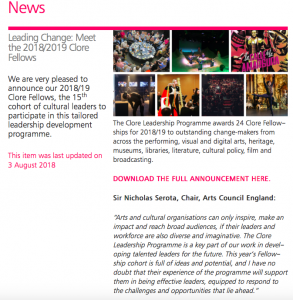 It’s a brilliant opportunity for me to get coaching, mentoring, to gain a wider understanding of the cultural sector, to learn from my 23 other fellows – and to go on secondment.